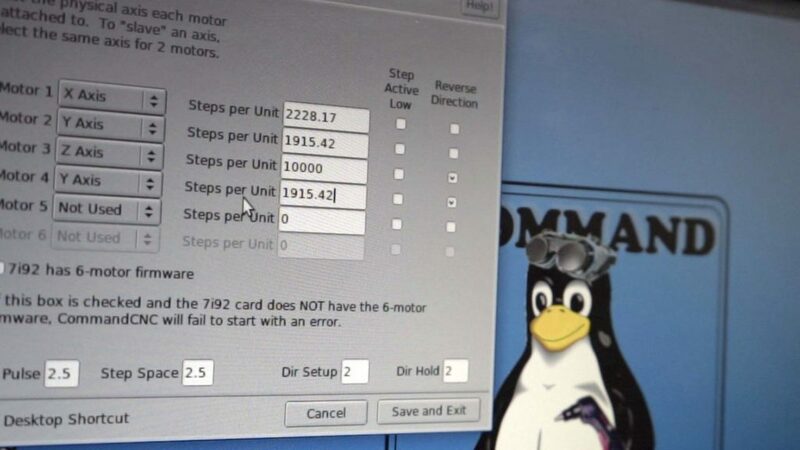 Now that you have the first calculation for steps per inch, you need to test the BladeRunner for motor control. Make sure you have all the cables connected. BladeRunner is plugged into power. 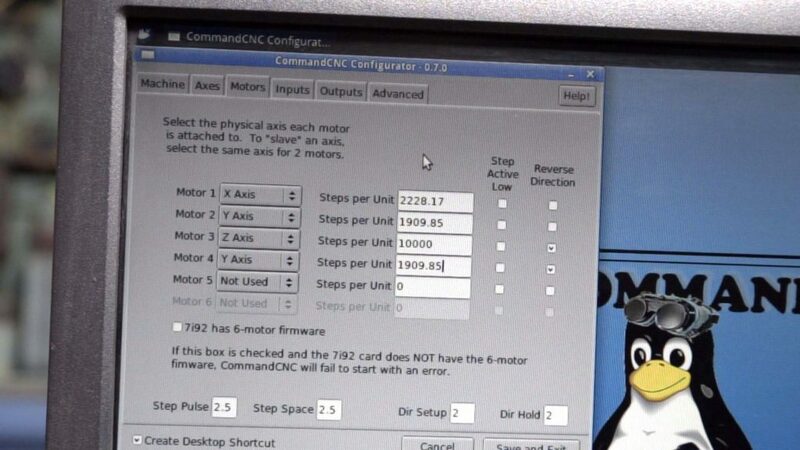 Load CommandCNC configurator and input the steps per inch that you have obtained in the motor section of your configuration and save and exit. If you are tuning an axis and it’s slave, input the same steps per inch into both. Power on the BladeRunner and the motors then load CommandCNC. Hit the “Reset” button. Jog your motors around to make sure they move the right direction based on the DRO. Movement away from x0, y0, and z0 should cause the respective DRO to increase. For the next steps in motor calibration we will be using the MDI screen to enter a motion command and check that the axis moves in the right direction and the proper distance. 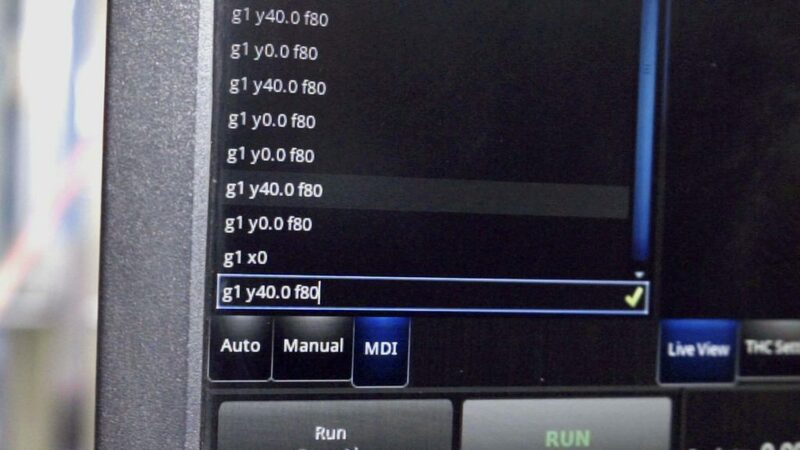 The MDI is a section to allow you to type in direct g-code commands to make the machine make specific moves. You don’t need to have a deep knowledge of g-code to use it for testing. G-code commands are not case sensitive but be sure to use zero’s and not “O’s” for the numbers. Make sure your machine is in e-stop before continuing. You will be working with the gantry and can get seriously injured. On your plasma table, remove the torch and either mount a laser or a sharp pointed tool in its place. Move this to a point that you can mark as a reference point for measuring. Mark the spot as precisely as possible. Back in CommandCNC in the MDI window, type in a distance to send that axis out using g-code. Here is an example: G1 Y30.0 F80 -G1 is a command that means to move in a straight line -Y is the axis we are working on -F is the feedrate we will be using Measure the actual distance traveled with a tape measure from 0 to the point where it stopped and write down the distance to as close a decimal as you can. Before you make any changes, move the axis back to the start point in the MDI window by using the following code: G00 Y0.000 (or whatever axis you are working on). It will not go back to the same point after you change the steps per inch. Divide the commanded distance traveled by the actual distance traveled then multiply the answer by the steps per inch. Close out CommandCNC and open the configurator. Input the new steps per inch and repeat the test. Measure again and fine tune the steps per inch until the actual and commanded distances are eyeball equal. Do this on all axes. For the slaved axes, use the same steps per inch for both motors.